With another wonderful sunset this evening we are winding down after several days of going through boxes, organizing, culling, disposing, and moving things around as we continue our “settling in” process. We aren’t in any real hurry so this process will continue at the pace we will dictate on a daily basis. This is a very nice feeling indeed! I have been spending a tremendous amount of time these last several days learning something that I have totally have no knowledge about – “water conservation irrigation systems!” In Pennsylvania we called it a “hose.” In California it is a programmed timer with irrigation zones each programmed for different on and off times and days (usually 7-10 minutes per zone if not in the BUDGET mode, whatever that is?). Drip lines with various drip heads that range from 1 – 6 gallons/hour, tee-connectors, angle connectors, and “boo boo” plugs are other hardware items I am learning about. Home Depot and Lowe’s both devote an entire aisle for irrigation systems which is usually located next to the “earthquake preparation” section. Fortunately we had a professional landscaper upgrade our backyard irrigation and drainage system which was outdated and a real mess. My training ground on this project has been Zone 6, the last of the original irrigation zones. I’ve installed drip lines to Judy’s plants that she has been potting and they will now receive their necessary H2O component on a regulated daily basis at the prescribed time – that was assuming that Zone 6 was installed in the computer properly. Judy continues to pot more plants, and she just won 4 more plants in a raffle today at her Temecula Valley Garden Club meeting. With more plants more drip lines have to be created. Unfortunately Zone 6 apparently is not currently recognized by the computer, so I am currently manually turning Zone 6 on for 10 minutes daily after all the other zones have finished their cycles. The most complicated thing about the PA hose was winding it back up after I got through watering. Much to learn. I’ve always liked succulent plants and now that we are in succulent plant country I am considering creating a succulent garden to replace some of the sod on our front lawn – NO hose or irrigation system necessary. 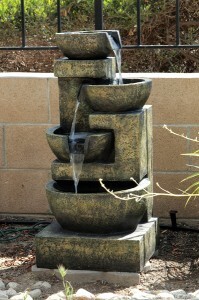 We purchased a new fountain that was more to our likeing than the one we inherited in the purchase of our home. The new fountain besides looking great during the day also has lights to make it appealing at night as well. Since our outdoor connection doesn’t have an in-house switch allowing us to turn the fountain on and off another project was created. A simple solution, and another trip to Home Depot, I thought. I passed up the irrigation and earthquake preparation aisle and headed for the outdoor electrical section. I found an outdoor timer with 6 outlets that boasted, “six individually timed outlets. Wow, probem solved I thought, I purchased the item and headed for home. I wanted the fountain to start in the morning, the lights to the fountain to come on in the evening and for everything to shut down at 11 PM and this item seemed to fill that need. Arriving home I prepared to setup the “perfect solution!” But upon reading the fine print on the “in-box instructions” for the 6-“individually-timed” receptacle outdoor outlet, it read, “TIMER REGULATES ALL OUTLETS!” “What,” I shouted, the description on the box suggests that the 6 outlets could be independently timed, but they were not. Not to be discouraged, I headed to our local Ace Hardware store and purchased a digital outdoor light sensitive switch that I attached to one of the 6 receptacles of the outdoor outlet. 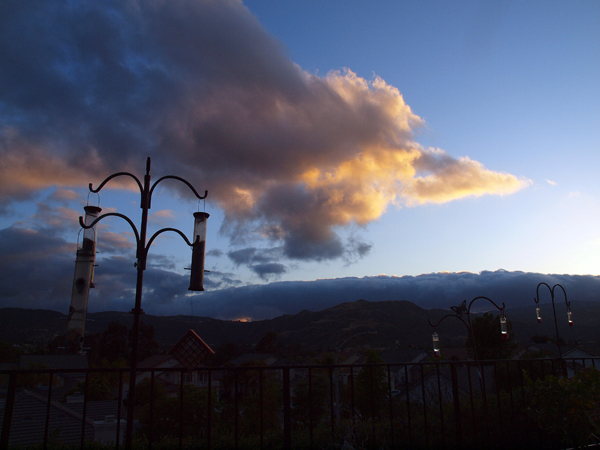 I attached the fountain light unit to the light sensor and all worked well – mission accomplished! Well, not exactly, as it turns out the light-sensitive unit is digital so once the outdoor outlet shuts down each evening so does the light-sensitive digital unit. It then must be reset daily to work again. Ah, so much more to do! The Adventure Continues . . . . . This entry was posted on Tuesday, May 11th, 2010 at 10:12 pm	and is filed under CA Home. You can follow any responses to this entry through the RSS 2.0 feed. You can leave a response, or trackback from your own site. Nice story. It’s cold (49F) and rainy here. No talk of drought yet this year.